Frank Lampard in a Swans shirt! Some Swans fans might think that this is just another April Fool’s day wind-up but I can assure you it’s not – former Chelsea and England midfielder Frank Lampard (now plying his trade with Manchester City) did indeed play for the Swans! 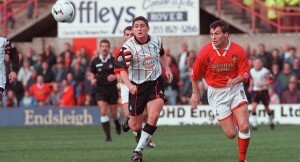 Aged just 17, Lampard Jnr joined the Swans on loan from West Ham United in October 1995 by then Swans manager Bobby Smith. At the time the Swans were struggling in the old Second Division but Lampard’s arrival saw a change in fortune for the Swans, as they defeated Bradford on his debut (2 nil) and won their first away game of the season during his nine game spell at the Vetch. If you were ever looking for a football related quiz question – then asking “With which club did Frank Lampard Jnr score his first career goal?” would be the perfect trick question to catch out any football know-it-all. The answer of course is Swansea City, where Lampard not only scored his first career goal but also his one and only Swans goal in the 2 nil win over Brighton and Hove Albion at the Goldstone Ground. Sadly at the end of October he returned to West Ham with manager Harry Redknapp pleased at the steep learning curve endured by Lampard during his short stint in Wales’ Waterfront City. I didn’t even know where Swansea was; I had to get a map out. Swansea’s training ground was a bit grotty and I was shocked at the lack of facilities, never mind the difference in the way they played… they knew I didn’t want to stay another month. We won about two games and there were only a couple of thousand fans there watching us struggle to avoid relegation. Despite his mis-givings of the club at the tender age of 17, Lampard has since grown to appreciate the impact his time at the Swans had on his illustrious career. I will always have a small place in my heart for Swansea. I had a couple of months at the club when I was 17 and driving down the M4 and playing at the old Vetch was a real eye-opener for me. I have always looked out for their results since then because you have that sense of attachment.